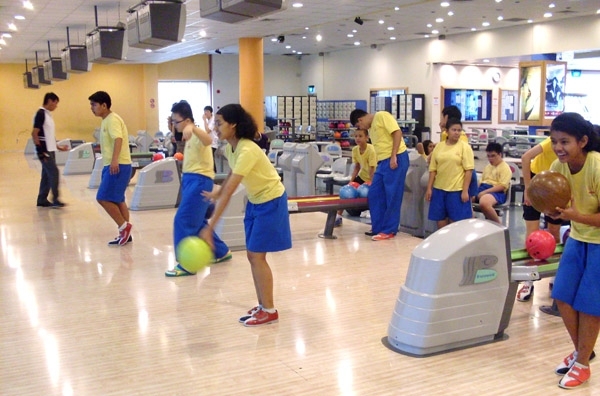 Come Mondays, Tuesdays and Wednesdays – youthful chatter and light-hearted footsteps echo along the walkway of Pasir Ris E!Hub and Tampines Safra, as groups of Metta School students make their way to the bowling centres for their weekly practice sessions. The one and half hour long session is punctuated with shrieks, claps, moans and groans. Emotions fluctuate with the turn of a ball, eyes glisten and faces light up with joy at a strike or a spare. Hearts sink and faces fall at the sight of a ball rolling towards the gutter. In all, it’s a session of delightful fun and excitement. Metta School has built of a track record of success at bowling competitions. The Bowlinks Bi-monthly Challenge has seen regular winners from the School, with Metta bowlers consistently clinching top positions in the competitions.